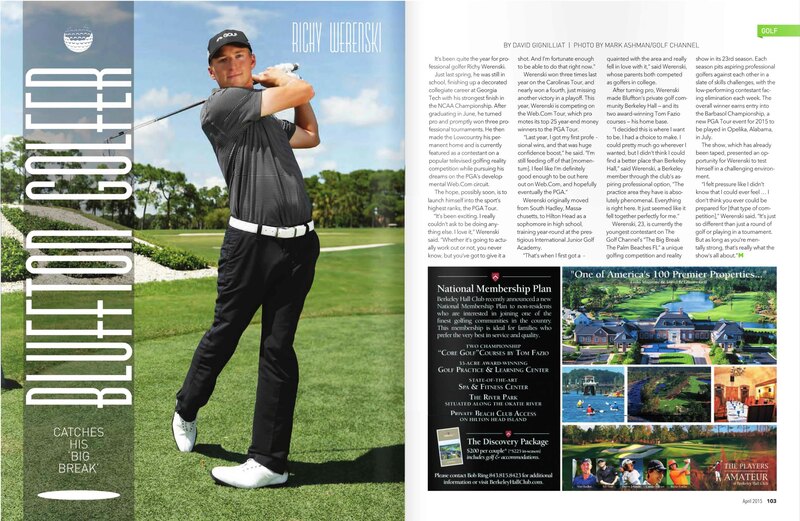 The April 2015 issue of Hilton Head Monthly features some familiar faces to IJGA friends and families. LPGA touring proReilley Rankin, Hilton Head Island, S.C., and Big Break The Palm Beaches FL. final three contestant Richy Werenski, South Hadley, Mass., are both featured in this month’s issue. Both pieces, penned by Hilton Head Monthly writer David Gignilliant, feature a glimpse into the lives of two former IJGA students who call Hilton Head home. Rankin’s story of perseverance and devotion to the game she loves through unbelievable odds would inspire anyone. 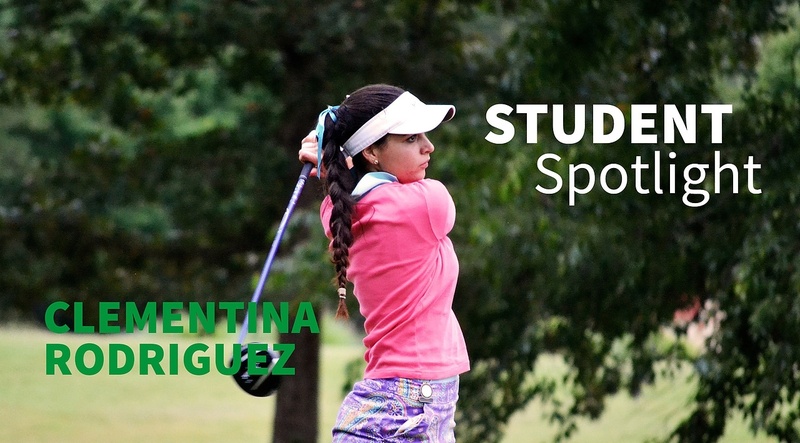 An early student of the IJGA, she went on to study at the University of Georgia where in 1998 tragedy struck. Rankin was severely injured when jumping from a cliff into an Alabama lake. The future LPGA tour member was told she would never walk, let alone play competitive golf again after breaking her back and sternum as well as bruising both her heart and lungs. To a girl who grew up in the area, not playing was not an option. She came back, stronger than ever, and led her Georgia team to the NCAA Championship in 2001. 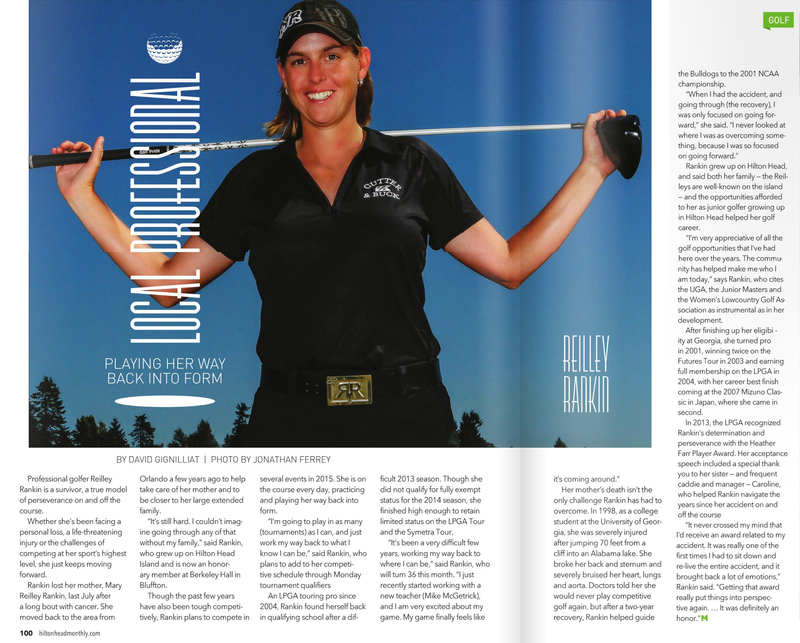 Following college she went pro and was enjoying her career as an LPGA pro. Then she found out her mother had cancer and in July of 2014, Mary Reilley Rankin lost her battle. Not long after winning the 2013 “Heather Farr Player Award” for perseverance the odds were stacked against Rankin again when she lost the LPGA touring status she’d had since 2004. 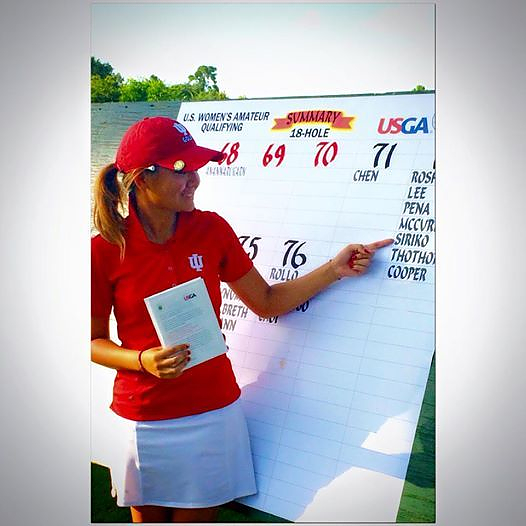 She is still on limited status for the LPGA Tour and Symetra Tour while working her way back to full-time status. Her story is accompanied, just one page later, by young up-and-coming professional golfer and IJGA alumnus Richy Werenski’s. Werenski, who came to the IJGA as a sophomore in high school, went pro right out of college as well. Last spring, he was worrying about things like his finals at Georgia Tech, where he was a four-year letter winner, and his team’s NCAA chances. Today he’s worrying about his performance on Big Break The Palm Beaches Fl and the Web.com professional tour. The youngest contestant on this season of Big Break, Werenski’s impressive resume includes a win at the Porter Cup and winning his first three professional events. He’s proved his younger age doesn’t mean he lacks any experience on Big Break The Palm Beaches Fl. as he avoided elimination challenges and earned immunity in seven straight episodes. Both golfers regularly play at the Berkley Hall Golf Club in Bluffton, S.C., where Rankin is an honorary member and Werenski is a member through the aspiring tour professional option. The IJGA is proud to be represented so well by these two professionals. We look forward to following their future successes!